Yesterday a new international trailer showed up for Quentin Tarantino's Django Unchained, and it might have been the best one yet. Now the hype for the film directed towards other countries keeps on coming. 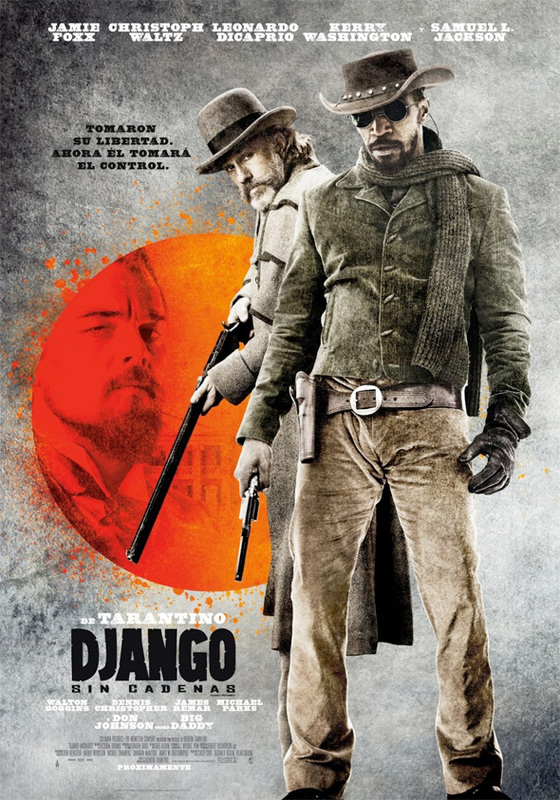 A new Spanish language poster (with the title being translated as Django Without Chains) has popped up, and it's a pretty stylish print. It certainly looks like a Western, and I like the use of the blood-splattered sun, complete with the villainous Leonardo DiCaprio inside of it. One might even infer that a setting sun doesn't give Django much time to get his wife back from that despicable plantation owner. Poster below! No don't like it. The low contrast between Waltz+Foxx and the background and DiCaprio in the sun-esque thing makes it all a blurry mess. Especially as the background texture conflicts with the costumes... Nope, not my cup 'o tea. Maybe, maybe it's done for the reason you mention. And yeah it's a bit creative. It's just not done well imo. To each his own though and I bet there are a lot of people who like it, so good for them. I just hope the movie is good, because the marketing so far was pretty bad. Just curious what the chances of the Master turning on the student or vice versa are in the storyline?